13Floor — стильная русская тема WordPress от ElegantTheme. Я опять в шоке, эта команда разработчиков каждый свой шаблон делает эксклюзивным, я бы даже сказал уникальным, так как такого шаблона как этот не встретить больше в нете. Я определил бизнес тематику этой теме, но это неограничение, посмотрите демо, этот шаблон можно отнести в любую категорию или тематику. Тема очень красивая и достойная, был бы буржуем не пожалел бы денег на этот шаблон, действительно достойный. В архиве вы найдёте ссылку на руководство по использованию этого шаблона, сам шаблон, который имеет epanel в админке WordPress после установки и настраивается полностью без редактирования файлов шаблона и на закуску psd файлы, которые могут пригодиться. — Updated all theme files to allow for the create of child themes. — Updated ePanel to account for WordPress 3.0. 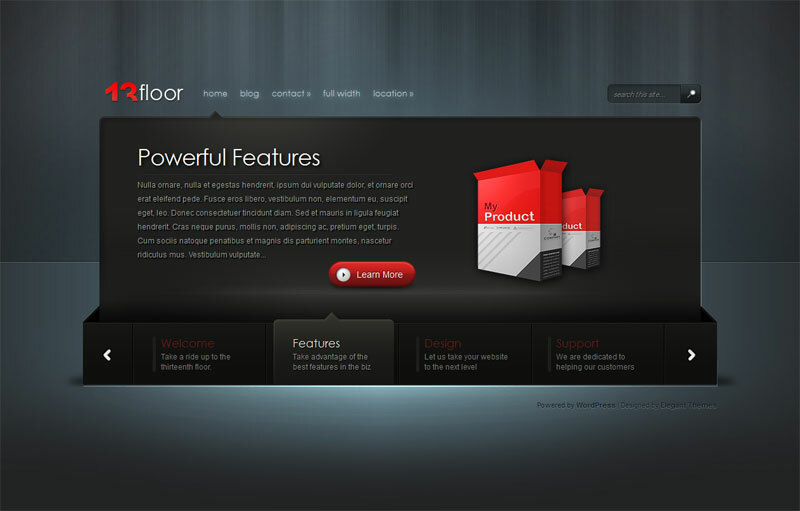 The 13Floor WordPress theme by Elegant Themes has a design as edgy as the name. Concentrating on sleek design and provided with the flexibility to function as a page- or post-based site, this theme is ideal for those who want to use their blog for business purposes and for those who like an eye-catching design for their personal sites. 13Floor offers five color schemes. The blog design is centered on powerful aesthetics, with Brown, Green, Blue, Yellow and Purple being theme options. For those looking for a very technical look, the Blue, Green and Purple schemes work very well. For those who want something more understated, the Brown and Yellow variations offer a surprisingly warm feel for such a cutting-edge theme. The text is displayed as white on black and the default font is rather small, so this theme is definitely better-suited to an audience that doesn’t have trouble reading off of a screen, such as younger blog readers. Where business use is concerned, the 13Floor theme delivers. The ability to structure the site as a page-based destination makes it ideal for businesses who want a fast and effective way to make a web presence that will be remembered. The blog comes with built in advertising management features. Ads can effortlessly be added to the sidebar or the post pages. If you’re interested in monetizing your blog, this feature will cut the amount of time and, thus, the amount of money, required. The 13Floor WordPress theme also includes the ePanel theme options feature, which allows the user to alter the look of their blog quickly and easily without the risk of code errors or other pitfalls. While this feature is made with user-friendliness in mind, it is also powerful enough to make managing a professional blog much easier. The integration of the Elegant Themes shortcodes feature also makes altering the layout and other tasks much easier than it is manually. The 13Floor WordPress theme is suitable for business or personal use. The outstanding feature in this theme is the ability to set up the site as a post- or page-driven affair, which even makes it feasible to change that choice at any time without a great deal of extra work. If you’re looking for a theme that’s easy to use but that also provides professional-quality looks and features, 13Floor is a good option.